QUETTA : Australian High Commissioner to Pakistan Margaret Adamson has called upon Balochistan Chief Minister Jam Kamal Khan to discuss investment opportunities in Balochistan. The provincial chief informed the Australian high commissioner regarding investment opportunities in provincial sectors and the provincial government’s social and economic development initiatives. “The livestock, mineral, fisheries and agriculture sectors have dozens of investment opportunities while we have opened our doors for international companies by adopting new amendments in provincial investment policy,” Jam Kamal informed Adamson. Kamal also briefed the high commissioner on the law and order situation in the province. “While the situation is fragile, the provincial government is working on security, while fencing on the border with Afghanistan has helped prevent the movement of terrorists,” he apprised her. Expressing interest in provincial resources, Adamson said that the Australian government is willing to invest in provincial natural resources and taking part in provincial development through multi-donor trust funds. “We have been providing assistance to the provincial government in rehabilitation of flood victims of Pishin and Qilla Abdullah”, she added. Friday said that development in Balochistan was crucial for Pakistan and the region’s economic uplift. She expressed these views while addressing students and faculty at the Balochistan University of Information Technology, Engineering and Management Sciences (BUITEMS) on Friday. Adamson said Australia would continue to cooperate in the sectors of education, livestock, agriculture and water resources in Pakistan, especially Balochistan. “There are many common aspects among Pakistanis and Australians, of which cricket is on top,” she said. She said providing quality education to Balochistan’s youth and polishing their hidden capabilities through various educational training programs would ensure their bright future. 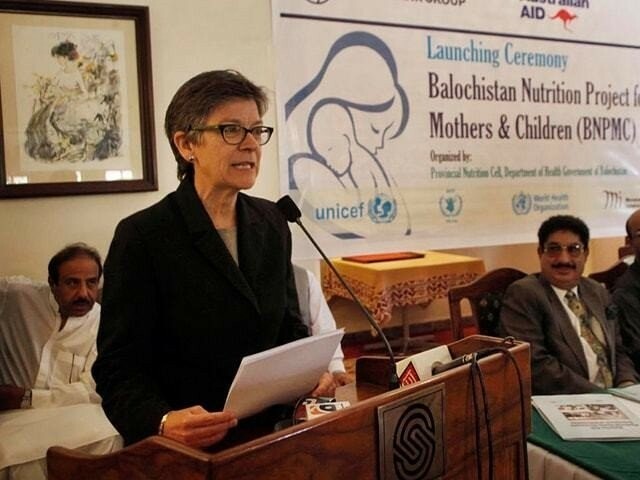 She said BUITEMS was one of the best educational institutions in Balochistan which was providing utmost research opportunities to young scholars. Later, a delegation headed by the Australian high commissioner visited various departments of the university including the Centre of Excellence of China-Pakistan Economic Corridor (CPEC).